Following up the popular 2014 release, 2015 Leaf Q Multi-Sport returns to the hobby with autographs for top athletes across the sporting world and even a few surprises. 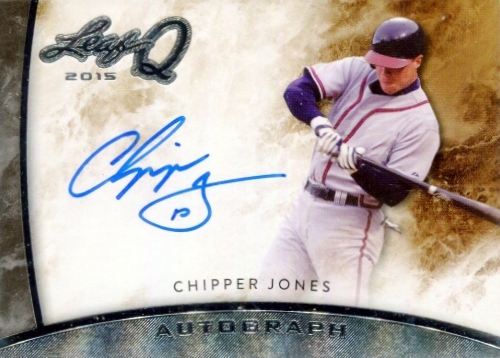 Seeing a price decrease from the previous edition, every hobby box yields five autographs. While the early checklist includes expected names such as Cristiano Ronaldo, Hank Aaron, Jack Eichel, Lionel Messi, Mike Tyson, Roger Federer and Tom Brady, a few unlikely subjects are also featured. Although they are not athletes themselves, Chevy Chase is found based on his dream sequence in Fletch where he played for the Los Angeles Lakers and Al Pacino also makes an appearance from his time as head coach Tony D'Amato in Any Given Sunday. These are similar to the Ed O’Neill as Al Bundy autographs from 2014 and should be equally popular. 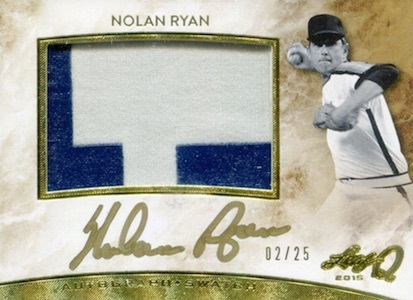 Like most of the high-end releases from Leaf, autographs come in several familiar forms. This includes regular Autographs, Autographed Patches, Pure Autographs and Cut Signatures. 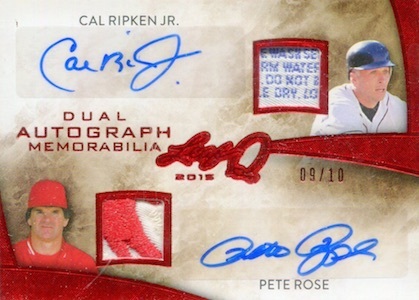 Another interesting option includes a dual cut autograph pairing of Pete Rose and former MLB Commissioner Bart Giamatti. The two are forever linked as Giamatti was at the helm when Rose was banned from baseball. 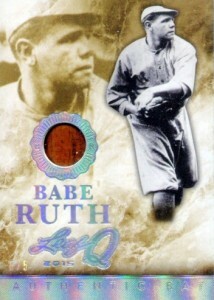 Collectors can also find limited Bat Relics for Babe Ruth that feature game-used memorabilia from his time with the New York Yankees or Boston Red Sox. These are the only non-autographs in the product. Total 2015 Leaf Q Multi-Sport production is limited to 399 cases. Larry Bird Magic Johnson 2015 LEAF Q DUAL AUTO RED SSP 1 5! FIRST! BGS9 MINT! 2015 Leaf Q CHRISTIANO RONALDO Auto SSP #7 10 Autograph Jersey Number! 33 cards. Redemption cards noted below. PARALLEL CARDS: Gold #/25 or less, Red #/10 or #/5, Silver Spectrum #/5, Gold Spectrum 1/1, Printing Plates 1/1. All subjects not included for printing plates. View specific options with the full spreadsheet. 1 card, serial numbered #/5. Redemption cards noted below. PARALLEL CARDS: Red #/3, Silver Spectrum #/2, Gold Spectrum 1/1. PARALLEL CARDS: Gold #/25, Silver Spectrum #/5, Gold Spectrum 1/1, Printing Plates 1/1. Card #P-HS1 not found in Purple Parallel. 20 cards. Redemption cards noted below. PARALLEL CARDS: Gold #/25, Red #/10, Silver Spectrum #/5, Gold Spectrum 1/1, Printing Plates 1/1. PARALLEL CARDS: Blue #/25 or #/24, Green #/10 or #/8, Red #/5, Purple 1/1.